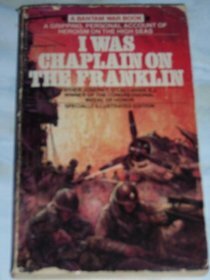 I have just finished reading I was Chaplain on the Franklin by Father Joseph T. O'Callahan for the second time, and I can confirm that it remains one of my favourite books on warfare. It's a short work, barely 150 pages, padded out with artwork and an appendix, and it tells a very simple story. But, it is a powerful tale. In 1945, as the American fleets were closing in on Japan, Father Joseph T. O'Callahan received orders to report aboard the aircraft carrier USS Franklin to serve as one of two chaplains. One month later, on page 56, the carrier was hit by a pair of Japanese bombs, which turned the ship into a fiery hulk. The rest of the book is given over to the fight to save lives, save the ship, or, in the chaplain's case, to help see dying young men into the next life. The book is packed with incredible feats of heroism. Despite Father O'Callahan winning the Congressional Medal of Honor for his actions on the stricken ship, the Catholic priest spends most of his narrative talking about the actions of his shipments, always attempting to give credit where it is do. It's an usual war story. There is little actual combat, but there is an incredible fight for survival. 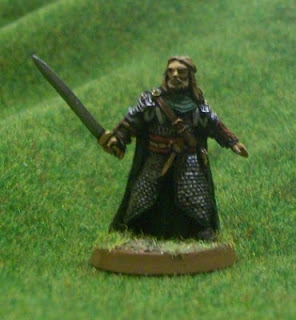 I guess it isn’t surprising that with the release of The Hobbit film, and my own re-reading of The Lord of the Rings, I have gotten back into Lord of the Rings miniatures in a big way. Middle-Earth has always been my favourite fantasy world, I have no doubt I’ll return to it many times again. This week I am showing off two of my latest figures, Hama and Eowyn, both of which were released in the wake of the Two Towers film. A few general observations. These are, without a doubt, some of the best miniatures I have ever seen. The level of detail, at a scale which is smaller than normal these days, is really incredible. The quality of these figures made me want to do my best possible paint job, and really that is how it should be. The first figure I painted was Hama. I’ve always had a soft-spot for Hama is a secondary (probably tertiary) character in The Lord of the Rings. He is captain of King Theoden’s guard, and his only real scene of note comes when he demands that Gandalf, Aragorn, Legolas, and Gimli leave their weapons outside of the Golden Hall. However, he does allow Gandalf to keep his staff, and it is certainly implied that he knew exactly what this meant. In the book, Hama is killed off-screen during the Battle of Helm’s Deep. In the movie, he is killed by a warg during the journey to Helm’s Deep. There is a wonderful amount of detail on this figure: intricate armour and greaves, belts and sash, hair and beard. I had so much fun applying careful brush-strokes to this figure, it single-handedly helped bring back the joy of painting that I had found flagging a bit beforehand. Next up is Eowyn, who I don’t needs any introduction. In a book filled with dramatic battles, she gets probably the most dramatic battle scene of all when she slays the Witch-King and the fell beast he flew in on! This is a slightly odd figure in that she is wielding a big sword, but is not dressed for battle. In fact, this figure is really simplicity personified. There is actually very little detail on it, and yet it is just as nice a figure as Hama. Without the distraction of numerous little bits, the craftsmanship in the folds of her dress and the waves of her hair really come to the fore. 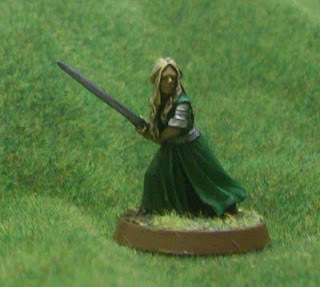 While it makes perfect sense to paint her wearing a green dress (the colour of Rohan), for some reason I gave her a silver belt. I don't think description actually appears in the book about Eowyn, but it is used for Goldberry. Anyway, it seems to work.